Early the next year, Simmons was named one of Billboard's "Artists to Watch 2011" and was selected to XXL's annual Freshmen list. In early 2011, Simmons joined a "behind the scene" group with several up and coming music artist at the time known as "B(before 20)12." Diggy went on His first tour for BET's 106 & Park "Closer To My Dreams" tour in the summer of 2011 starring Tyga, Mindless Behavior, Lil Twist, Jawan Harris, and Trevante. He released his first major-label single, "Copy, Paste", soon thereafter. "Copy, Paste" peaked at number 24 on the Billboard Hot R&B/Hip-Hop Songs chart in September. The song's video was directed by Phil the God, who previously directed Simmons' "Made You Look", "What They Been Waiting For" and "Shook Ones". Simmons performed the song during the pre-show for the 2011 BET Awards. His second tour was Scream Tour's Next Generation tour in the fall of 2011 with Mindless Behavior, Jacob Latimore, New Boyz, and OMG Girlz. Simmons is featured on the singles "Like 'Em All" by Jacob Latimore, "Mrs. Right" by Mindless Behavior and "Yeah Right" by Dionne Bromfield. "Yeah Right" reached number 36 on the UK Singles Chart in April 2011. "Click Clack Away", a song featuring Bruno Mars, leaked onto the internet in May. Simmons noted that the track would not be included on his debut studio album, set to be released by the end of the year. That month, Simmons released the song "Just Begun" however Simmons tweeted on Twitter it was not going to be on the album. On October 24, 2011 Diggy released "Do It Like You" as the second official single from his debut album, Unexpected Arrival a music video has been released with the song's featured artist Jeremih appearing in the clip. Also on February 24 the song "88" was released as the third official single. The song features Jadakiss and a viral music video was released for the track. 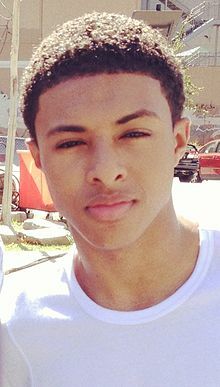 Diggy's debut album Unexpected Arrival was released on March 20, 2012, a day before Simmons' 17th birthday. Billboard said it was "easy to find yourself nodding along". The third was his own "Life of The Jetsetter Tour" in late early 2012 with returning acts Jacob Latimore, OMG Girlz, and added were Jawan Harris & new hip-hop duo TK-N-Cash. In 2012, it was announced that Simmons would once again embark on a tour with Scream Star Entertainment, and got his own headlining spot. The Scream Tour: Next Generation (Part 2) began in late August 2012 with special guests Jawan Harris, OMG Girlz, TK-N-Cash, YMCMB's Torion, and more. Simmons announced that he was releasing his fourth mixtape titled, Out of This World via Twitter. 'Out of This World' was set for release in 2013, but has yet to have been released. On December 22, 2013, Simmons released an unofficial single after a year-long hiatus entitled "Mama Said" featuring B.o.B & Key Wane. In May 2014, Simmons released the first single from his upcoming EP Out of This World entitled "My Girl" featuring Trevor Jackson. "My Girl" official video was released on May 7, 2014. On February 10, 2015 Simmons released his first single in 3 years, "Ain't Bout To Do" featuring French Montana. Following this, Diggy released a second single, "Can't Relate" ft Yo Gotti on April 9, 2015. Simmons is set to appear on Scream Nation's Back 2 School Fest starting September 11, 2015 in Florida. Simmons landed his own 2-hour TV movie/show pilot on BET titled "The Start-Up". Simmons plays Blake, a 19-year-old college student and blogger who tries to get his blog of 5+ years up and running with the help of his friends. Teyana Taylor stars also. This project is set to premiere September 19, 2015. Simmons got media attention when he made an unexpected comment stating that, "love is an emotional roller coaster and I've fallen in love." during a TMZ interview about a movie he starred in called "The start up". Diggy has also a recurring role on the TV series Grown-ish where he plays Doug, Jazlyn's (Chloe Bailey) boyfriend. ^ a b c d e f Jeffries, David. "Diggy Simmons - Biography". AllMusic. All Media Network. Retrieved September 21, 2011. ^ a b Kyles, Kara (August 26, 2011). "Even More Diggy: Kyles Files Complete Q&A with Diggy Simmons". RedEye. Retrieved February 16, 2016. ^ Feeney, Michael J. (March 24, 2010). "Diggy, Son of Run-DMC Rapper Rev. Run, Inks Deal With Atlantic Records - Without Dad's Help". Daily News. Retrieved September 21, 2011. ^ Ivey, Nile (March 31, 2010). "Diggy Simmons Explains Signing With Atlantic Records, Talks Five Label Bidding War". BET. Retrieved September 21, 2011. ^ "New Music: Diggy Simmons f/ Pharrell & Lupe Fiasco – 'Oh Yeah!'". Rap-Up. August 21, 2010. Retrieved September 22, 2011. ^ Malcolm, Jomarie (October 5, 2010). "Diggy Simmons is Airborne". The Jamaica Observer. Archived from the original on 2012-08-19. Retrieved September 21, 2011. ^ a b Johnson, Derryck "Nes" (November 19, 2010). "Diggy, 'I'm Really Trying to Push the Bar With Hip-Hop'". XXL. Harris Publications. Retrieved September 21, 2011. ^ a b Concepcion, Mariel (December 23, 2010). "Diggy Simmons Celebrates Christmas With DJ Premier-Hosted Mixtape". Billboard. Prometheus Global Media. Retrieved September 21, 2011. ^ "Diggy Simmons: Artists To Watch 2011". Billboard. Prometheus Global Media. January 24, 2011. Retrieved September 21, 2011. ^ "XXL 2011 Freshmen Class: Diggy Simmons". XXL. Harris Publications. Retrieved September 21, 2011. ^ Stewart, Allison (May 30, 2011). "Singles File: Wu-Tang featuring RZA, Diggy Simmons's 'Copy, Paste'". The Washington Post. Retrieved September 21, 2011. ^ "Billboard Top R&B/Hip-Hop songs". Billboard. Retrieved September 21, 2011. ^ Markman, Rob (June 28, 2011). "Diggy Simmons' 'Copy, Paste' Is 'Anthem' For Innovators". MTV. Viacom. Retrieved September 21, 2011. ^ "Rap-Up TV: On Set of Diggy Simmons' 'Copy, Paste' Video". Rap-Up. June 30, 2011. Retrieved September 22, 2011. ^ Thomas, LeVar (June 27, 2011). "Diggy Simmons 2011 BET Awards Performance". Stupid Dope. Retrieved September 21, 2011. ^ Bylin, Kyle (July 7, 2011). "Uncharted Territory: Diggy Simmons Returns, The Knocks Feel 'Sunshine'". Billboard. Prometheus Global Media. Retrieved September 21, 2011. ^ "Lo nuevo de Dionne Bromfield, la protegida musical de Amy Winehouse". ABC (Spain). August 29, 2011. Retrieved September 21, 2011. ^ "Chart Stats - Dionne Bromfield - 'Yeah Right' ft Diggy Simmons". Chart Stats. Retrieved September 22, 2011. ^ Ramirez, Erika (May 3, 2011). "Press Play: Freddie Gibbs, Young Jeezy, Diggy Simmons, Bruno Mars, Solange & More". Billboard. Prometheus Global Media. Retrieved September 21, 2011. ^ Cline, Georgette (September 1, 2011). "Diggy Simmons Won't Use Ghostwriters, Talks New LP". The Boombox. AOL. Retrieved September 21, 2011. ^ Fitzgenjkj, Trent (September 19, 2011). "Diggy - 'Just Begun' – Song Review". PopCrush. Retrieved September 21, 2011. ^ Jon Blistein (2012-03-20). "Diggy, 'Unexpected Arrival': Track-By-Track Review". Billboard. Retrieved 2017-04-05. ^ Roc, G. "Chivalrous Culture Footwear – First Look". The Show Game. Retrieved 31 August 2015. ^ Elder, Brandon (February 16, 2011). "Diggy Simmons Launches Sneaker Line: Chivalrous Culture". Complex. Retrieved September 21, 2011. ^ a b "Billboard Hot 100". Billboard. Prometheus Global Media. Retrieved September 21, 2011.